A good vinyl door is indistinguishable from a wood door. Vinyl screen doors are popular with homeowners who want a low-maintenance screen door that will not rot or need to be repainted. New vinyl doors can easily be mistaken for wood screen doors, especially if you choose a classic style. While there are many reasons to pick a vinyl door over metal or wood, homeowners are often persuaded by one of these three reasons. A good vinyl door is made of solid pieces of vinyl that are fitted together, just like a traditional wood door. Lots of vinyl doors have a wood-grain pattern that looks like painted wood, even under close examination. Expensive vinyl doors also have a detail level similar to ornate wood doors, with inlaid panels and other bits of craftsmanship. Vinyl doors are often less expensive than a comparable door made out of a hardwood. A lower price gives the homeowner a larger range of styles to pick from that fit within their budget, without sacrificing quality construction techniques. Vinyl doors do not have to be repainted or sealed every three to five years. They do not rot like wood doors, reducing the chance that they will need to be replaced. They do not warp like some wood doors. Vinyl does not expand and contract with the humidity and temperature as much as wood, making it easier to get a tighter fit when installing a door. A solid core vinyl screen door should be as easy to install as a traditional wood screen door. Although more expensive, a solid core screen door is preferable for this project because it can be trimmed as necessary to fit the existing door opening. Standard woodworking tools should suffice if you need to modify the door. If your house was built within the last twenty years and the exterior door opening is a standard size, you can purchase a hollow core screen door. Keep in mind, however, that most hollow core doors are inferior to solid core screen doors. Start by carefully measuring the opening of your exterior door. Check and make sure it is square and note any abnormalities. Buy a solid core vinyl door that matches the door opening measurements as closely as possible at any home improvement center, such as Lowe's Home Improvement Store or the Home Depot. Although a screen door should always swing out, it is your choice whether or not you want it to open on the left or the right. Pick the side that will be most convenient when opening the door. Carefully place the screen door in the door opening. If it does not fit, trim the door an even amount on each side using a lathe. Begin by attaching the hinges to the screen door. If there are no pilot holes in the door, be sure to drill some before attaching the hinges. Drill pilot holes into the door frame that correspond to the hinges in the door. Place the screen door in the door frame, once again checking for fit. Screw the screen door into place when you are satisfied. Install any additional hardware that was purchased with your screen door, such as a hydraulic closer or screen door handle. While a vinyl door may suit many homes, homeowners that conduct exterior home renovations often may prefer a traditional wood door. 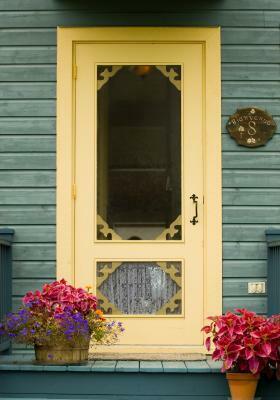 Wood screen doors can be repainted easily, while vinyl doors are often difficult, if not impossible to repaint. Historic homes or homes that have traditional wooden clapboard should also consider keeping a their wood screen doors over new vinyl doors for authenticity's sake.